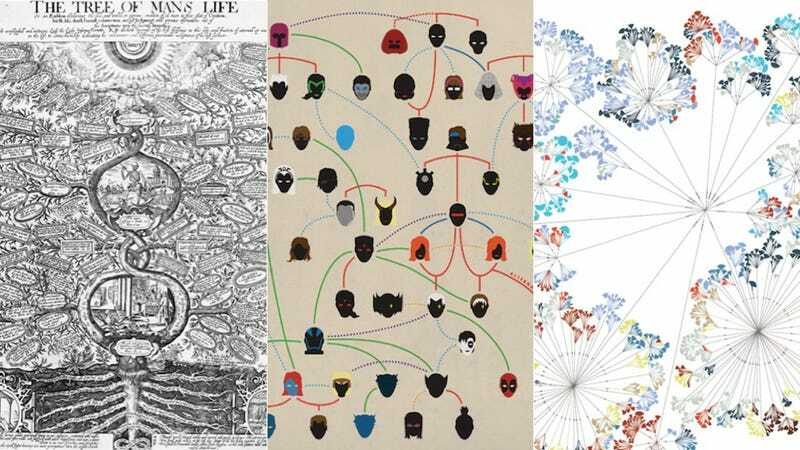 Infographics might seem like a modern phenomenon—citizens of the internet love nothing more than a nice and tidy presentation of catchy stats—but data viz dates way, way back. In The Book of Trees: Visualizing Branches of Knowledge, interaction designer Manuel Lima examines a recurring theme: more than eight centuries' worth of trees used as diagrams, and why botanical iconography has endured from those early days through to the digital revolution. Lima, who also authored Visual Complexity, charts the motif through mythology and folklore, as a celestial and religious symbol, following family lines and genealogies, open-source software classes, and, well—pretty much anything that can be quantified can be, and has been, given the tree-treatment in some figurative or abstract form. The book comes out in April (pre-order here), but I got to check it out a little early and I've picked out some of my favorites entries. Word Tree by Martin Wattenberg and Fernanda Viégas, 2008. Here's every sentence in the bible that starts with: "And God." Writing Without Words by Stefanie Provosec, 2008. Whoa. This baby was hand-drawn, and maps the structure of Part One of Kerouac's On the Road. The Tree of Life by Yifan Hu (AT&T Labs—Research), 2011. Data from the Tree of Life Web Project, a large online collaborative effort on biodiversity was used to create this An chart depicting the phylogeny of 93,891 organisms. Treebolic by Bernard Bou, 2003. A depiction of the animal kingdom, divided by class and species. Chart Showing the Principal Constituent Elements of the Population of Each State by Francis A. Walker, 1874. This was compiled using info from the ninth U.S. census, divided into squares for foreign-born, native white, and native non-white residents. Tweetgeister by Brent Schneeman, 2010. A visualization that reveals clusters of concepts within Twitter that attempts to diagram how hashtagged tweets relate to one another, based on semantic similarities. Vortices, from Principia Philosophiae by René Descartes, 1644. An illustration of the Cartesian system of vortices, a seventeenth-century explanation of the universe where "large whirlpools of tenuous or ethereal matter that were thought to move the planets and their satellites by contact."